Abdul Karim, A. F., Ismail, H., and Ariff, Z. M. (2016). "Properties and characterization of kenaf-filled natural rubber latex foam," BioRes. 11(1), 1080-1091. Kenaf powder was incorporated with natural rubber latex (NRL) compound and foamed to make natural rubber latex foam (NRLF) by using a well known technique called the Dunlop method. Different loadings of kenaf powder were added to NRL compound and was foamed to make NRLF. The mechanical properties, density, compression, thermal, and micro-structural characterization of control NRLF and kenaf incorporated NRLF were studied. Increasing content of kenaf reduced the tensile strength, elongation at break, and compressive strength of a NRLF. Modulus at 100% elongation and density of the NRLF increased with an increase in filler loading. Higher kenaf loading indicated higher elasticity of kenaf-filled NRLF, but the recovery percentage of kenaf-filled NRLF decreased with increasing kenaf loading. 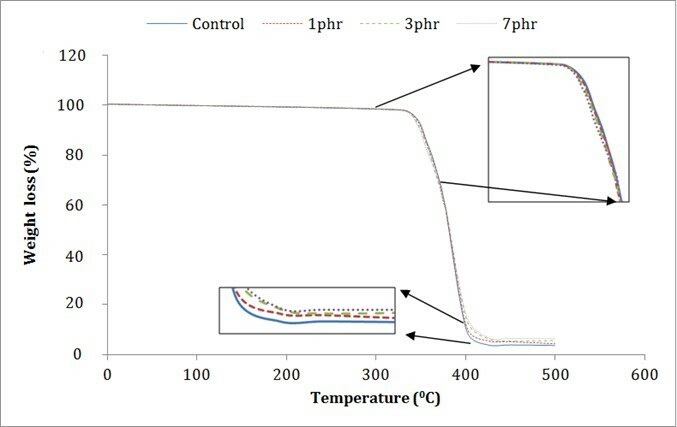 From thermogravimetric analysis (TGA) result, an increase in the amount of kenaf loading from 1 to 7 phr increased the thermal stability of kenaf-filled NRLF. Morphological and micro-structural characterization performed by using scanning electron microscopy (SEM) showed that kenaf powder filled up the micro-sized pores in the open cell structure of kenaf-filled NRLF. Kenaf is a natural (plant) fiber that is widely used as reinforcement in Polymer Matrix Composites (PMC) (Karnani et al. 1997). Kenaf, (Hibiscus cannabinus, L. family Malvaceae), has been found to be an important source of fiber for composites and other industrial applications (Karnani et al. 1997). Kenaf is well known as a cellulosic source with both economic and ecological advantages. Generally, natural fibers such as kenaf fibers contain 60 to 80% cellulose, 5 to 20% lignin, and up to 20% moisture (Akil et al. 2011). Cellulose obtained in kenaf has the strength and stiffness of the fibers via hydrogen bonds and other linkages. Hemicellulose is responsible for biodegradation, moisture absorption, and thermal degradation of the fibers (Ismail et al. 1999; Akil et al. 2011). Research efforts are in progress to incorporate kenaf in polymers to enhance the physical, mechanical, and tribological properties of the composite especially in PMC. In recent studies, enhanced understanding about the reinforcing mechanisms in Kenaf Fiber/PLA and Kenaf Fiber/PP Composites have been achieved (Han et al. 2012). Natural rubber latex (NRL) is harvested from the rubber tree, Hevea brasiliensis. NRL is a stable colloidal dispersion of polymeric particles in an essentially aqueous medium. The term also can be defined as a dispersion of natural rubber particles in water (Ramasamy et al. 2013). Natural rubber latex concentrates have been commercially available since 1930 and subsequently have been exploited for the manufacture of a great variety of products (Roberts 1988). In early 1914, Schidrowitz and Goldsbrough made an attempt to produce a porous rubber product from NRL concentrates, called “latex foam” (Ramasamy et al. 2013). Latex foam can be defined as a cellular rubber that has been made directly from liquid latex. One of the well-known processes to make latex foam is called the Dunlop process, and it has been mainly used in manufacturing of thick molded latex foam products such as pillows, cushions, and mattresses (Ramasamy et al. 2013). The goal of this work was to study the mechanical properties, density, compression, rubber-filler interaction, and thermal and micro structural character of composites. Neat NRL control samples were compared with kenaf-filled NRLF. Table 1 shows the formulation and materials used in this research. Natural rubber latex (Low Ammonia (LATZ) type) and latex’s chemical purchased from Zarm Scientific & Supplies Sdn. Bhd, Malaysia were used in this research. Kenaf fiber supplied by National Kenaf and Tobacco Board was ground and sieved into an average particle size of 300 µm. Firstly, low ammonia latex concentrate (LATZ) type NRL was filtered and weighed according to the formulation. Then, latex was stirred for about 10 minutes by using a mechanical stirrer at low speed. After 10 min, vulcanizing agent (sulphur) was added to the latex and stirred at 10 rpm. After 15 min, zinc 2-mercaptobenzhiozolate (ZMBT) and zinc diethyldithiocarbamate (ZDEC) were slowly added to the mixture, followed by antioxidant. After 1 hour of continuous stirring, foaming agent (potassium oleate soap) was added slowly to the mixture, which was stirred continuously at 10 rpm for 6 h at room temperature. After 6 h of continuous stirring, the NRLF compound was foamed using the stand mixer (Kenwood, kMix). The NRLF compound was beaten intensively for about 5 min until the volume of the compound increased up to three times its initial volume. Foaming speed was lowered to obtain a fine and even foam once the desired volume was obtained. After that, kenaf powder was slowly added to the mixture according to the formulation, and the compound was beaten by using stand mixer for about 5 min until the homogenized compound was obtained. Next, the primary gelling agent (zinc oxide, ZnO) together with diphenylguanidine (DPG) was added to the foam, and beating was continued for another 1 min. Then, the secondary gelling agent (sodium silicofluoride, SSF) was added and the foam was beaten for 60 seconds. Finally, the un-gelled foam was obtained and the un-gelled foam was quickly poured into the desired aluminum mould and allowed to gel for 3 min at ambient temperature. Gelled foam was then cured in a hot air oven at 105 oC for 2 h. Once the foam was cured, the kenaf powder filled NRLF foam was stripped from the mould and washed thoroughly with distilled water to remove the excessive non-reacted materials. After washing, the cured NRLF was dried in a hot air oven at 80 oC for 8 h. The well dried foam will appear to be off white in color. The same steps were used for the preparation of the control sample of NRLF with zero kenaf loading. Tensile tests were carried out according to ASTM D 412 by using a universal testing machine Instron 3366. Dumbbell shaped samples were cut from the kenaf powder incorporated NRLF by using a Wallace die cutter. Five samples were required from each loading of kenaf powder. The tensile test was performed at ambient temperature with a crosshead speed of 500 mm/min. Samples of kenaf powder filled NRLF with 0 phr (control NRLF), 1 phr, 3 phr, 5 phr, and 7 phr filler loading were tested. Tensile properties such as tensile strength, tensile modulus and elongation at break were obtained from tensile testing and the average results were reported. The compression tests were carried out in parallel and perpendicular direction to the foam rise by using universal testing machine, Instron 3366. Specimens’ dimensions were 50 x 50 x 25 mm. A testing speed of 50 mm/min was used, and the test was performed at test temperature of 25 oC. 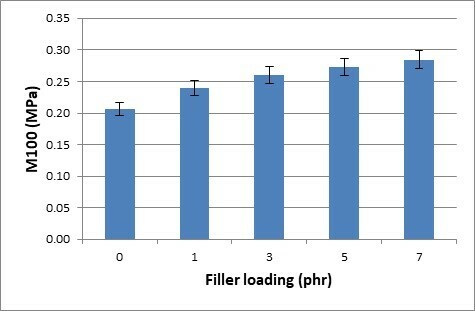 Five samples from each filler loading were tested, and averages were plotted. The compression strength and rigidity modulus were measured. where A is the mass of the specimen (kg) and B is the volume of the specimen (m3). Compression set properties of kenaf-filled NRLF were evaluated according to ASTM D3574. Samples used were in regular shape of 50 mm x 50 mm x 25 mm with parallel top and bottom surface and essentially perpendicular sides. Three specimens per samples were tested. Specimens were placed in the test apparatus and deflected to 75 ± 1 % of their original thickness. Within 15 min, deflected specimens and the apparatus were placed in mechanically convected air oven overnight with a test temperature of 70 ± 2 oC. Specimens were immediately removed from apparatus and measured after 30 minutes recovery. Compression properties such as constant deflection compression set and recovery percentage were obtained from this testing. The TGA of kenaf-filled NRLF samples were operated using a Perkin Elmer Pyris 6 testing instrument. Samples of the kenaf filled NRLF samples were tested at a heating rate of 20 oC/min from 30 oC to 600 oC under nitrogen gas conditions. The TGA values were recorded. A scanning electron microscope (SEM) was used to study the surface morphology of the kenaf powder-filled NRLF samples. Firstly, kenaf powder filled NRLF samples was sputter-coated with a thin layer of gold to avoid electrostatic charging and poor image resolution during examination. Then, coated foam surfaces were mounted on aluminum stubs. 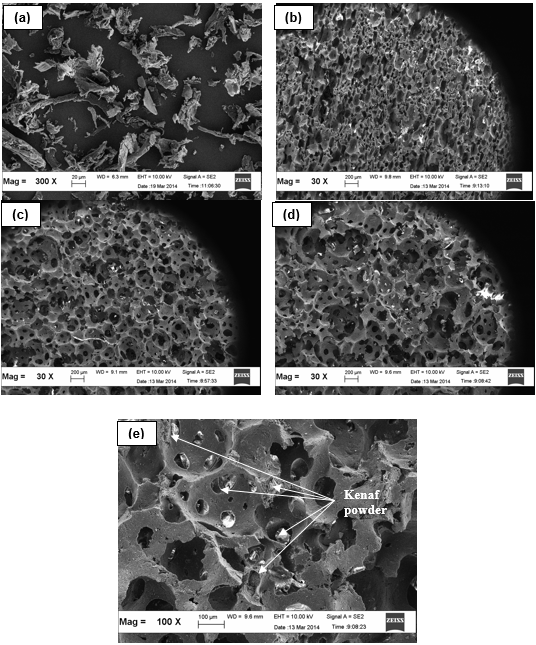 From the micrograph of SEM, the rubber-filler interactions and kenaf dispersion were evaluated as well as the pore morphology of the foams. Results related to the tensile strength of kenaf-filled NRL foams are shown in Fig. 1. Tensile strength dropped as kenaf loading increased. The filler–matrix interaction was low; hence there was a reduction in tensile strength. The strength of a composite is expected to depend on the filler-matrix interfacial interactions. Considering that the fiber surface was not treated and that no compatibilizer or coupling agents were used in this work, it was reasonable to find that the strength was not improved significantly. 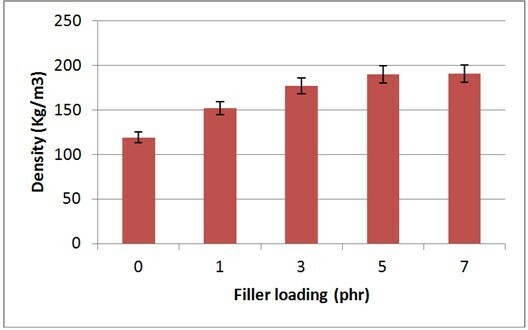 This is expected because although no agglomeration was observed by SEM, as the filler content increases there is more filler surface that needs to be wetted by the polymer in order to have good contact and sufficient stress transfer, and less polymer that is available to wet the fibers, so the strength started to decrease upon further addition of fillers. Difficulties were faced to incorporate a higher filler loading above 7 pphr for kenaf powder-filled NRLF. When the filler loading increased to more than 7 pphr, the stability of the foam was drastically decreased and the foam collapsed. Figures 2 and 3 show the results of elongation at break and modulus tests at 100% elongation (M100) of control NRLF- and kenaf-filled NRL foams. Compared to control NRLF, elongation at break decreased with increasing kenaf filler loading, whereas the opposite trend was observed for the modulus at 100% elongation (M100). The incorporation of kenaf into NRL compound tended to increase the rigidity of the foams and restricted the mobility in between flexible rubber chains. The elasticity of foam was reduced, resulting in a stiffer and more rigid foam. This led to lower resistance to breakage (Muniandy et al. 2012). A reducing trend in elongation at break was attributed to the addition of kenaf powder, introduced more flaws to the kenaf powder filled NRLF resulting from the low kenaf-rubber interaction. The modulus increased upon addition of the kenaf powder because kenaf has significantly higher modulus, ~70 GPa due to the high cellulose content (Chen and Porter 1994; Mohd Yuhazri et al. 2011). Figure 4 represents the effect of kenaf loading compression strength of control NRLF and kenaf-filled NRLF. The stress versus strain curves show that higher amounts of force were required to compress kenaf-filled NRLF with higher kenaf loading. 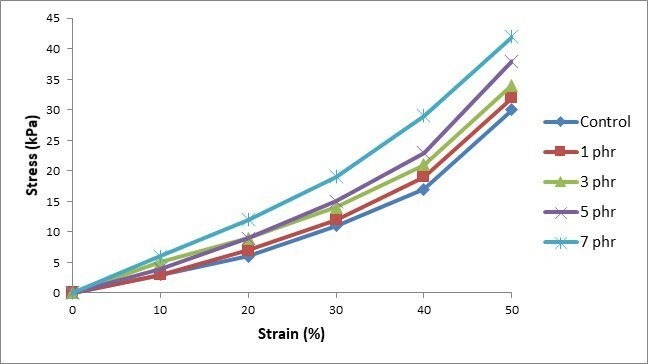 Figure 4 shows a clear trend of increasing stress with increasing kenaf loading at 0, 10, 20, 30, 40, and 50% strain. At 50% compression, NRLF with 7 phr kenaf showed the highest stress value of stress, while 1 phr kenaf loading showed the lowest stress value. Hence, it is clearly shown that kenaf filler loading contributes to an increase in rigidity of kenaf-filled NRLF. 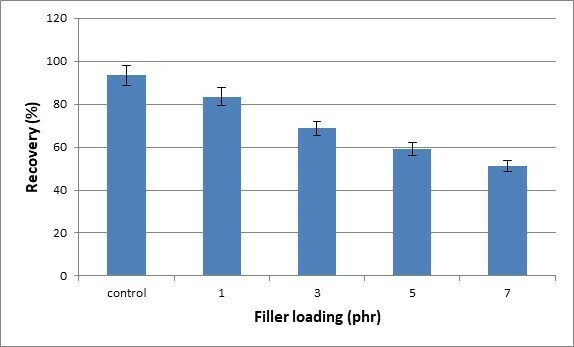 Figure 5 represents the effect of kenaf filler loading on the foam density of kenaf incorporated NRLF. Foam density of control NRLF (zero kenaf filler loading) was 219 kg/m3. Then, the density drop at 1 phr kenaf incorporated NRLF which has a density of 152 kg/m3. 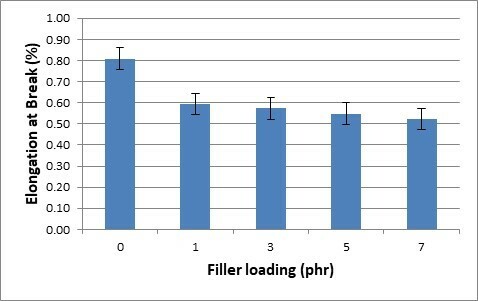 The density of NRLF increased with 3, 5, and 7 phr kenaf filler loading, which each show a density of 177 kg/m3, 190 kg/m3, and 195 kg/m3. 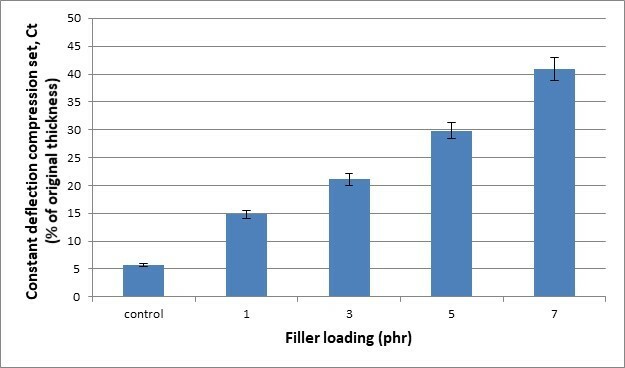 Figure 5 clearly shows that foam density of kenaf powder filled NRLF increased with increasing filler loading from 1 phr until 7 phr. This is due to the fact that kenaf filler loading contributed to an increase in mass of kenaf-incorporated NRLF. The compression set is the measure of the elastic behavior of the materials. Figure 6 shows constant deflection compression set, Ct of control and kenaf-filled NRLF. From Fig. 6, the control NRLF exhibited the lowest compression set and then the compression set increased with higher kenaf loading, which indicates the lower elasticity of kenaf-filled NRLF. Meanwhile, Fig. 7 shows that the control NRLF had the highest recovery percentage compared to kenaf-filled NRLF. The recovery percentage of kenaf-filled NRLF decreased with increasing kenaf loading. Non-elastic deformation was mainly due to the deformation of the hard phase of which more kenaf is present. This led to slower recovery and may explain the higher compression set observed after 30 min relaxation. Table 2 and Fig. 8 show the results of TGA of control NRLF and kenaf-filled NRLF with 1, 3, and 7 phr of kenaf loading. Weight loss of kenaf-filled NRLF with increasing temperature under nitrogen environment was measured, and a graph of weight loss as a function of temperature was plotted. Table 2 shows the temperature at 5% weight loss, maximum weight loss (%), temperature at maximum weight loss rate (oC), and final char residue (%). Temperature at 5% weight loss decreased with increasing kenaf loading from 1 to 7 phr. Decomposition of celluloses in kenaf occurred at a lower temperature. In fact, the primary thermal decomposition of cellulosic materials like kenaf occurs between 200 and 400 oC, and the chemical changes take place mostly in the amorphous regions (Fisher et al. 2002). Increasing amount of kenaf causes the decomposition of celluloses in kenaf at lower temperature. From Fig. 8, controlled and kenaf-filled NRLF experienced weight loss from 340 oC to 590 oC, which relates to the decomposition of natural rubber and cellulose content of kenaf. The thermal stability of polymer was reduced by an increase in kenaf loading from 1 phr to 7 phr. As mentioned before, these phenomena were due to the decomposition of kenaf powder at low temperature. Amorphous regions in cellulosic materials can promote the ignitability of the cellulose at lower temperatures, and thus they accelerate the degradation process. The dispersion and distribution of the kenaf powders in NRLF were studied using SEM. Representative SEM images are shown in Fig. 9. Figure 9(a) shows a micrograph of kenaf powder. The irregular structure of kenaf powder is clearly apparent. This can be related to the reduction in tensile strength due to the non- reinforcing kenaf fiber due its irregular structure morphology. Figure 9 (b), (c), and (d) shows the open cell structure of control sample, 3 pphr, and 7 pphr filler loading. 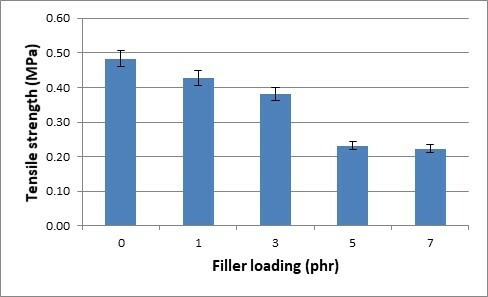 By comparing Figure 9(b), (c), and (d), the size of the pores increased as the filler loading increased. The increase in size of the pores contributed to reduction of tensile strength, elongation at break and compressive strength of kenaf filled NRLF. Figure 9(e) shows the distribution of different size of kenaf inside NRLF at 7 pphr kenaf loading. From the figure it can be seen that the filler fills up the micro sized pores in the open cell structure of NRLF. This shows that filler did not bind well with the matrix which causes the reduction in tensile strength. Fig. 9. (a) Micrograph of kenaf powder at magnification of 300X, (b) Micrograph of surface of control sample NRLF at magnification of 30X, (c) Micrograph of surface of 3 pphr kenaf-filled NRLF at magnification of 30X, (d) Micrograph of surface of 7 pphr kenaf-filled NRLF at magnification of 30X, (e) Micrograph of kenaf dispersion on 7 pphr kenaf-filled NRLF at magnification of 100X. The tensile strength and elongation at break of kenaf-filled natural rubber latex foam (NRLF) decreased with an increase in filler loading, while modulus at 100% elongation increased. An increase in kenaf loading reduced the elasticity of NRLF, resulting in more stiff and rigid foam. The stiffness of kenaf powder-filled NRLF increased with increasing kenaf loading due to the ability of kenaf powder to impart greater stiffness to the NRLF. Increase in kenaf loading contributed to an increase in mass of kenaf powder in NRLF; thus the density of kenaf-filled NRLF increased with increasing kenaf loading. From TGA, by increasing the amount of kenaf loading from 1 phr to 7 phr, the thermal stability of kenaf-filled NRLF was increased. Morphological study by using SEM showed that kenaf powder, which had an irregular structure, did not bind well with the matrix, which can account for the reduction in mechanical strength. Kenaf powder acted as a non-reinforcing filler in the present work, and some modification needs to be done to enhance the mechanical properties of kenaf powder-filled NRLF. The author would like to gratefully acknowledge the Research University Grant, Cluster for Polymer Composites (CPC) of Universiti Sains Malaysia (Grant Number 1001/PKT/8640014) and MyBrain15 of Ministry of Higher Education Malaysia for the financial assistance. Akil, H. M., Omar, M. F., Mazuki, A. A. M., Safiee, S., Ishak, Z. A. M., and Abu Bakar, A. (2011). “Kenaf fiber reinforced composites: A review,” Materials Design, 32, 4107–4121. Chen, H. L., and Porter, R. S. (1994). “Composite of polyethylene and kenaf, a natural cellulose fiber,” Journal of Applied Polymer Science. 54, 1781–1783. Fisher, T., Hajaligol, M., Waymack, B., and Kellogg, D. (2002). “Pyrolysis behavior and kinetics of biomass derived materials,” Journal of Analytical and Applied Pyrolysis 2(2), 331-349. Ismail, H., Mohamad, Z., and Abu Bakar, A. (2003). “A comparative study on processing, mechanical properties, thermo-oxidative aging, water absorption and morphology of rice husk powder and silica fillers in PS/SBR blends,” Polymer Plastic Technology and Engineering 42, 81-103. Ismail, H, Nasaruddin, M. N., and Ishiaku, U. S. (1999). “White rice husk ash filled natural rubber compounds: The effect of multifunctional additive and silane coupling agents,” Polymer Testing 18, 287-298. Jonoobi, M., Harun, J., Shakeri, A., Misra, M., and Oksman, K. (2009). “Chemical composition, crystallinity, and thermal degradation of bleached and unbleached kenaf bast (Hibiscus cannabinus) pulp and nanofibers,” BioResources 4(2), 626-639. Karnani, R., Krishnan, M., and Narayan, R. (1997). “Biofiber-reinforced polypropylene composites,” Polymer Engineering Science. 37, 476-483. Khalf, A. I., and Ward, A. A. (2010). “Use of rice husks as potential filler in styrene butadiene rubber/linear low density polyethylene blends in the presence of maleic anhydride,” Mater Design. 31(5), 2414-2421. Mohanty, A. K., Misra, M., and Hinrichsen, G. (2000). “Biofibres, biodegradable polymers and biocomposites: An overview,” Macromolecular Materials Engineering. 276, 1-24. Muniandy, K., Ismail, H., and Othman, N. (2012). “Fatigue life, morphological studies, and thermal aging of rattan powder-filled natural rubber composites as a function of filler loading and a silane coupling agent,” BioResources 7(1), 841-858. Ramasamy, S., Ismail, H., and Munusamy, Y. (2013). “Effect of rice husk powder on compression behavior and thermal stability of natural rubber latex foam,” BioResources 8(3), 4258-4269. Ramasamy, S., Ismail, H., and Munusamy, Y. (2013). “Preparation and characterization of rice husk powder incorporated natural rubber latex foam,” Advanced Materials Research 626, 523-529. Ramasamy, S., Ismail, H., and Munusamy, Y. (2013). “Tensile and morphological properties of rice husk powder filled natural rubber latex foams,” Polymer-Plastic Technology and Engineering 51(15), 1524-1529. Roberts, A. D. (1988). Natural Rubber Sci. Technol., Oxford University Press, Oxford, UK, 1136 pp. Wambua, P., Ivens, J., and Verpoest, I. (2003). “Natural fibres: Can they replace glass in fibre reinforced plastics?,” Composites Science Technology 63, 1259-1264. Article submitted: May 28, 2015; Peer review completed: August 11, 2015; Revised version received: November 18, 2015; Accepted: November 20, 2015; Published: December 9, 2015.